The inevitability of loss doesn’t make loss easy to deal with, but the circumstances around it can certainly make it harder. Mark Baumer, writer, performance artist, activist and amazing human being, was hit by a car and killed on the 100th day of his barefoot hike across America, a project he chronicled on his blog called “Not Going To Make It”. Mark was a regular Coincidental Hour fixture when I performed in Providence. He was a natural fit to be on a Coincidental Hour bill, never failing to perplex. From drinking a gallon of milk and then running around the room kicking the jug as hard as possible, to playing in a band that just wanted to talk, Mark was provocative by just being unabashedly Mark. Mark was on to something. You could really sense that he was settling into his own as an artist and individual. He was a weirdo, one of the best, and his weirdness could often be socially challenging. “I don’t get it” was a common response to Mark’s work. But Mark was saying something. Without compromise, he was saying something important, he was saying it impressively, and people were listening. No matter how adult I get, and despite being faced with difficult challenges and injustices with more regularity and facing them with more informed reactions as I age, sometimes a situation can only merit the simple response: It’s not fair. It’s not fair that the world, so desperate for heroes and artists taking action, loses an activist like this. It’s not fair that such a kind human being, an artist really starting to blossom, can be taken away at 33. It’s not fair that we couldn’t see him finish. 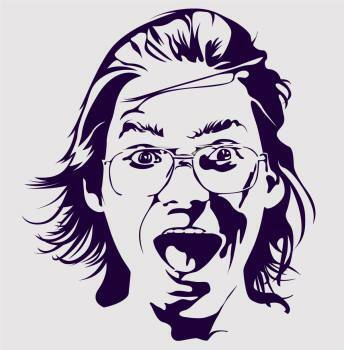 Love you Mark Baumer. You moved and have moved us.